Google has been rolling out impressive updates this year to keep the Android experience as best as possible for the users. Earlier last week they released a new update for Google Maps which would allow people on wheelchairs to navigate through the city with ease. This time, again using their official blog as the launchpad for this new feature they have introduced the newest Files Go. The Google Files Go app helps Android users free up space, find files quickly and also share them easily with people nearby. Google took to their blog and has announced the coming of new features for the Files Go application. Google has obviously been known to implement its highly efficient search algorithm in a lot of places. They have finally used this technology to run searches on the Files Go whereby people will be able to search files with ease and be assisted by more features such as the autocomplete, search history, instant results and file management. Google has also confirmed that the feature will run offline and will be an appreciable development regarding file management on Android devices. Users will now have a smooth and fast experience while searching for files on Android. Files Go implements a very useful feature which deletes the duplicate files present on your phone. Earlier, even though the application was able to find and delete the duplicate files, it was important that the user sometimes check the source of the duplicate from where the file is being deleted. 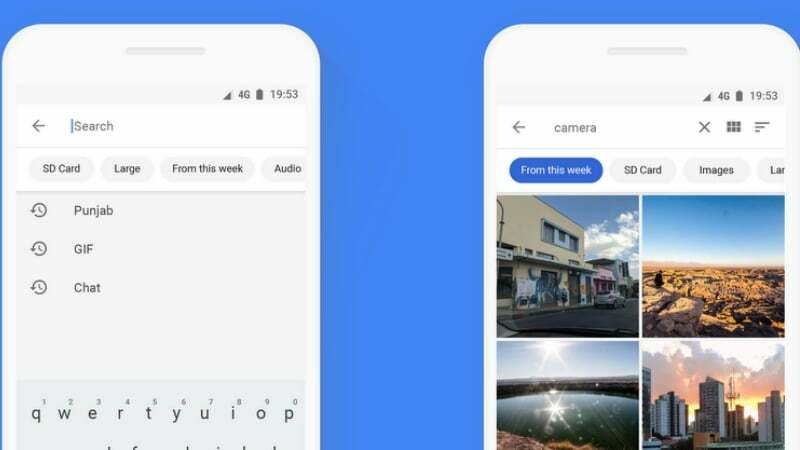 Following that demand, Google has brought the feature to the Files Go app, and now users can check the location of the files by just tapping on the “i” icon after pressing on the thumbnail of the file. Files Go runs smoothly in sync with the popular Google Photos application. The Files Go update will allow the app to send a notification to the user telling that a set of photos has been uploaded to the Photos app and can thus be deleted from the device. This update is not only useful to keep track of photos which are uploaded in the cloud but also helps in reducing occupied storage by these redundant photos or files. The new Google Files Go application is already made available for Android users on Google Play Store. Navigate to Play Store and download the app for free.